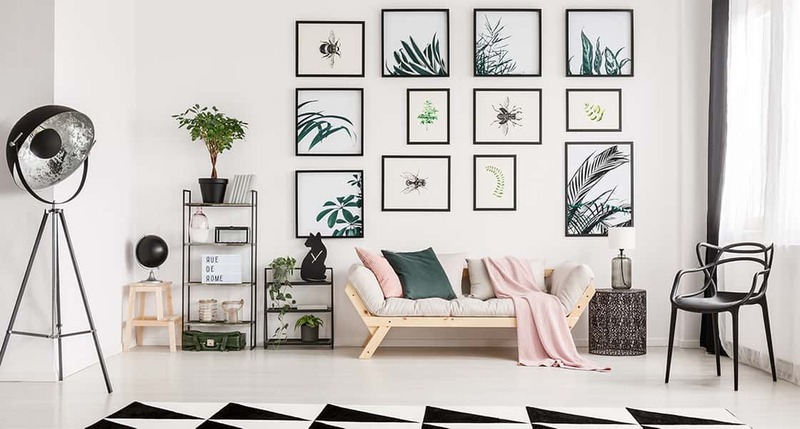 From minimalist décor to statement pieces and a muted colour palette, modern home design is one of the biggest trends in interior design right now. Modernising your home is a great opportunity to freshen up your home’s look and feel, while also integrating the latest smart home gadgets and appliances. Whether you’re gearing up to sell or just in the mood for a change, these home décor ideas and home automation ideas will instantly add a contemporary touch to your property. One of the best ways to modernise your home is to get rid of the excess clutter and only focus on décor that adds to the overall aesthetic of your home. Rather than displaying a host of small trinkets on your shelves, or putting out all the coffee table books you own, choose a few statement pieces that work with your home’s colour scheme. Remember: less is more. Go beyond cosmetic changes and truly modernise your home with tech. Smart home hubs integrate your phone and your home tech together for easier home automation and lifestyle management. Whether you choose Google Home, Amazon Echo, or Apple’s HomePod, your smart home device can set alarms for you, monitor security systems, dim your lights, or play music. 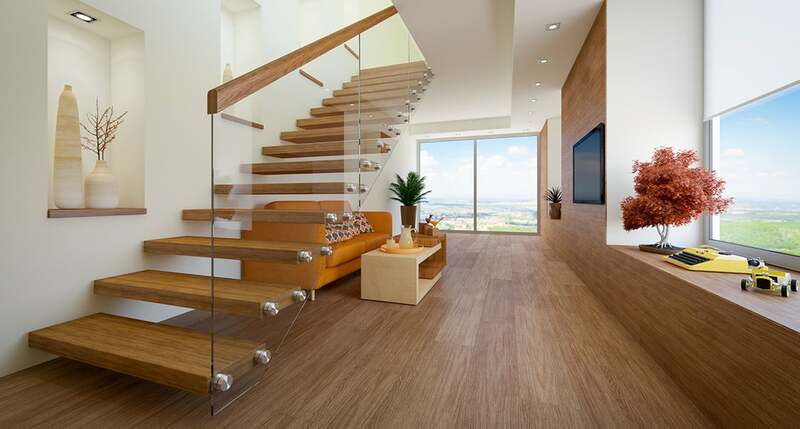 If you’re renovating your home and want to achieve a modern look, organic materials are a great choice. Installing stone benchtops and dark wood cabinets can instantly transform your kitchen and dining area; alternatively, bamboo flooring or exposed brick walls are perfect for giving your home that an industrial chic look. Glass and contemporary home design go hand in hand, but there’s no need to bring in glass furniture – instead, use glass to open up your living, dining, and bathroom areas, and add a touch of natural light. Replace shower curtains or patterned screens with a clear shower screen to give your bathroom a modern touch, or install glass walls with panels to separate your living and dining area while still keeping a semi-open plan style. Tip: pair glass with white furniture and railings for Hampton Style living, or combine glass and wood to give your property a natural luxe feel. 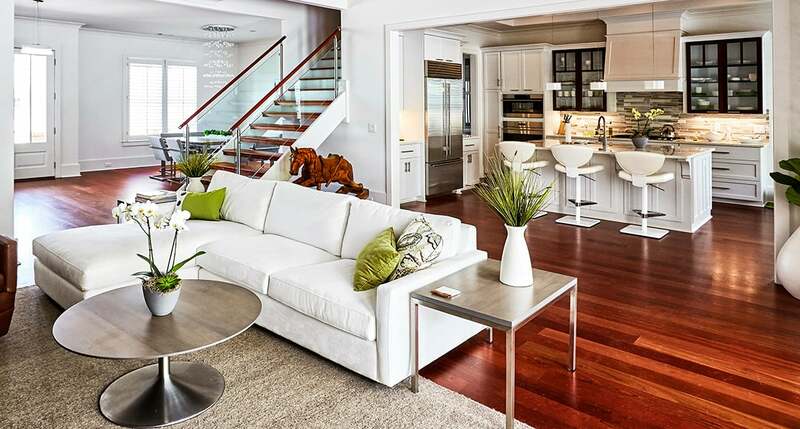 Open plan living is one of the best home interior design ideas if you want to create a contemporary look in your home, while also creating more space. Before breaking down the walls in your property, start by planning the different ‘zones’ and how you can create subtle separations between them: for example, a bar can separate your kitchen from your dining room, while rugs can be a great stylistic transition from your dining area to your living space. Lighting can have a huge effect on your home’s style, and when it comes to modernizing your interior design, an upgrade to your lighting can work wonders – particularly if you’re looking for affordable home automation ideas. Smart lighting systems can change hues based on your mood, dim the lights using your phone or voice commands, and set a schedule for your lights to turn on or off after work. Most smart light systems are compatible with a smart home hub and connect via Bluetooth, but make sure to check this before you kit out your entire property. There’s a common misconception that modern home design is all based on white, grey, and black colour schemes. The best home décor ideas include pops of colour to brighten up a home and add a touch of personality and flair. Integrate colour into your home with bright wall art, or go bold and choose a bright colour scheme for your cushions or rugs. No matter which colours you choose, just make sure they complement each other – when in doubt, use a colour wheel tool to help you find the right scheme for your home. While carpets are great for insulation and soft on the feet, they can be difficult to clean and may start to look worn over time. If you’re ready and willing to make some big changes to your property, it could be a good time to switch to floorboards: not only do they look more modern, but they’re also easier to clean and stand the test of time. The colour you choose will largely depend on the size of your room and the look you’re going for – lighter shades make your room look larger and sunnier, while darker shades give your home a more dramatic and rustic feel. Open shelving is perfect if you have a blank wall and want to increase the amount of functional storage space in your home. Add open shelves behind your sofa and display some photos or sculptures, or use open shelves to add additional storage in your kitchen, and use these to store your favourite glasses or crockery. Modern homes are bright and airy, and if you want to freshen up your interiors, adding a new coat of paint is one of the easiest solutions. Choose crisp white shades for a clean and minimalist look or, if you’re going for something a bit more daring, choose a bright shade and create a statement wall. RELATED: What's the best paint colour for selling your house? When it comes to modernising your home, remember that less is more. By decluttering, investing in quality pieces of statement furniture, and making a few changes to your flooring or living areas, you’ll have a contemporary home that looks beautiful and will stand the test of time.